Hillco’s Super Cruise held on Super Bowl Sunday has been an annual event since 2004. The entire Hillco team has always looked forward to the event because it gave all of us an opportunity to see and share your projects and works of art on wheels. It is therefore with no small amount of regret we announce that there will be no future Super Cruise events. Ownership of our building and several other properties within our complex has changed and the new owner’s concerns regarding the issue of liability and property damage has made it impossible for us to continue the show. We want to thank everyone who took part in our Super Cruise over the years. 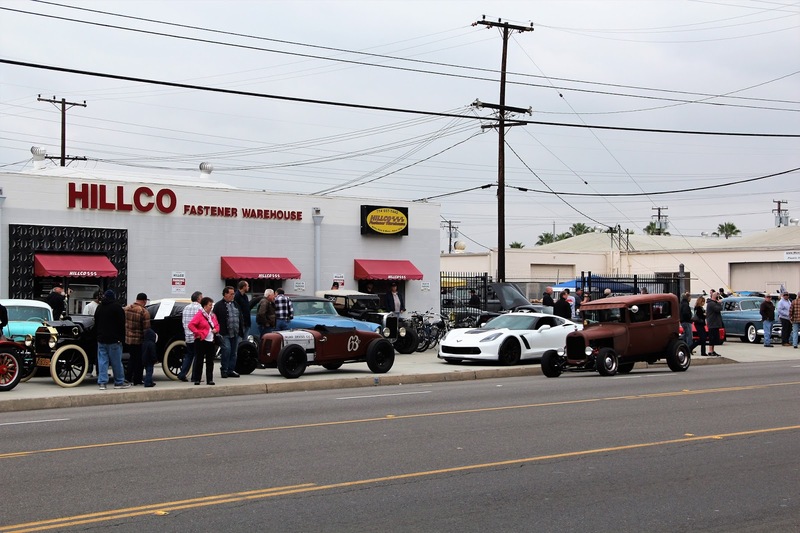 It became a spectacular show that our customers and local car aficionados looked forward to. A special thank you to our many sponsors and to Gary Brown the OC Car Guy, Dave Lindsay of Socalcarculture.com, and Ryan Portemour of Hotrodresource.com for their part in publicizing the show and helping to make it such a huge success. We look forward to seeing all of you at Hillco whenever you have a need for a special fastener and please feel free to bring your projects by for us to admire or just come by the warehouse to say hello! We have received several inquiries recently regarding black oxide finish. Black oxide is a conversion coating (as opposed to an applied coating) because it results from a chemical reaction with the iron present in the metal fastener and forms an integral protective surface. It is a color of the base metal, which neither removes nor deposits metal. Therefore, it adds, at the most, 5 to 10 millionths of an inch to the fastener's dimensions. Likewise, it cannot chip, peel or rub off, and the item maintains 99% of its conductivity making black oxide a popular finish for electrical parts. When a black oxide finish is specified, it is called out as "Black Oxide and Oil". Other supplementary coatings such as wax or lacquer may be ordered, but fasteners with those finishes are usually not available from stock and must be a special order. Typically, the oil after-finish is dry to the touch, which gives the part a lustrous appearance and improved lubricity without excessive residue. The color is a deep black rather than the grayish-black appearance of black phosphate, and remains consistent at temperatures as high as 900 degrees Fahrenheit. Black oxide also resists abrasions better than phosphate, and one of the most important advantages is that there is almost no risk of hydrogen embrittlement because the process does not involve electro-plating nor does it require an acid-activation. Case hardened parts need not be baked after receiving a black oxide finish. Black oxide neither enhances nor detracts from a fastener's resistance to corrosion. The post-treatment oil application offers good indoor corrosion protection, but a zinc-plated part is more resistant to rust. However, parts with a black oxide finish will not suffer from white corrosion which can occur over time with electro-plated parts. To avoid the risk of white corrosive particles (which can cause electrical shorts) many in the electronics industry opt for black oxide instead of zinc plated fasteners. The popularity of black oxide stainless fasteners is also growing. In addition to being used for decorative purposes, the finish reduces light glare and reflection and makes the surface of the fastener smoother. The automotive aftermarket utilizes them in tail-light assemblies, grills and windshield wiper assemblies, to name a few. Fastener threads provide both load holding when tightened and the ability to move during tightening and loosening. A fastener's pitch and lead, determined by whether it is coarse or fine thread, is a factor in fastener performance. A coarse thread will move a larger distance with each rotation than a fine thread of the same diameter. If speed of assembly is a factor, a coarse thread may be preferred as it will assemble faster. If adjustment is required, a fine thread will provide a less sensitive adjustment and a greater ability to control adjustment. Each flank of thread carries a percentage of the clamping load. This load is not distributed equally among the thread pitches in most applications. It is generally thought that a fine pitch thread will have a more uniform load distribution among its engaged pitches when installed. Fine threads can be more susceptible to cross-threading if assembly conditions are not controlled. In general, both coarse and fine threads have advantages depending on the fastening output required. 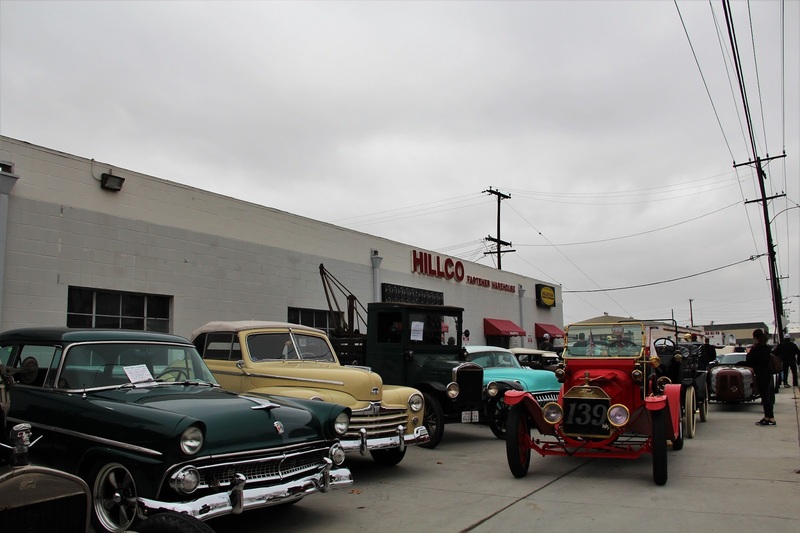 Hillco’s annual Super Cruise took place Sunday, February 5, and we had a great turnout! Although it threatened to rain throughout the day, we were lucky to enjoy cool weather and gray skies (perfect for car-show photography!). The many who did attend had a great time checking out what has become the most diverse collection of cars, trucks, and bikes in one show, enjoying the food and participating in our raffle. Conversations with the builders helps one appreciate the history, hard work and craftsmanship required in each project. Many are so beautifully planned and executed that they are more a work of art than merely just a car. From the daily driver to the trailer queen, it was all here on show day, which is the main reason many love attending this event. On behalf of Hillco’s entire staff, thank you for attending, and a special thank you to Gary Brown (The OC Car Guy) for emceeing and organizing our event and donating to our raffle, Tom Leroux of Hoist Services, Joe and Arlene Jill of Superior Automotive, Stephanie Hill of Stephanie Hill Photography, Los Alamitos Brew Kitchen, Brighton Best International, and Joe Leroux and the Road Devils for their generous donations to our raffle that helped to make Super Cruise XIV a great success. Special thanks to the Hillco staff for their enthusiasm and support in putting on this event. Thank you again to all who attended. We will be posting photos from the event on our Facebook page, so please share with your family and friends. As most of you already know, Hillco is a family-owned and operated business established in 1976. Super Cruise Sunday is our annual customer appreciation event which gives us an opportunity to see your projects and raise funds for veterans and first-responders via donation to Gary Sinise Foundation. We look forward to seeing all of you next year! When working on automotive restoration or repair projects it's very difficult to figure out exactly which fasteners you'll need for either fabrication or final assembly, i.e. body bolts, fender bolts and nuts, etc. Our new ProShop Assortment removes much of the guess work! Our PSA100-178 assortment includes factory body bolts, u-nuts and j-nuts needed for your automotive project, and they work for most pre-1980 GM, Ford & Chrysler products! Fasteners are the last thing you think of and the first thing you'll need for your project, so be sure to plan ahead! Two Israeilis, two Palestinians and an Arab walk into a room . . . sounds like a very bad ethnic joke doesn’t it? In fact, it is what my son Ryan and I experienced at the SEMA show in Las Vegaslast week. For those unfamiliar with the SEMA show, it is the premier trade show for the automotive after-market industry and is held in Las Vegasevery year. Manufacturers and distributors from all over the country present their new products and prototypes to the automotive aftermarket industry. Seeing three groups of people who can’t get along on the world stage but have a common interest in this wonderful machine we call the automobile had a great impact on me. The desire to build and make available something different and extraordinary is a common bond shared by all those attending the SEMA event, and it is our goal at Hillco Fastener Warehouse as well. The SEMA show is the largest trade show in Las Vegas. Attendance is in the hundreds of thousands every year. Not only did we did we get to meet the folks mentioned above, we also had visitors to Hillco’s exhibit from Colombia, Mexico, Panama, Qatar, Venezuela, Japan, Australia, New Zealand, Germany, Sweden, and Denmark, just to name a few. You may be wondering why automotive enthusiasts from all over the world come to the States to attend SEMA. I believe it is because of our wonderful, unique in the world, American culture. The Germans, French and Italians, as well as the English, began building automobiles at about the same time or earlier than we were in the U.S. What is it about the U.S. market that is so appealing? I believe it is the unique laissez-faire (in French it means leave us alone) attitude of the American car culture. The American hot rod industry is the very essence of individual creativity and innovative engineering . . . sometimes good, sometimes not so good, and much of the time extraordinary, and always interesting and exciting. I believe that is the allure for automobile enthusiasts from all around the world. When one buys a chopper with all its garish chrome and loud engine, they are buying American culture. The same is true with a low rider bouncing up and down or going low and slow with music blaring, or a Corvette going 220 mph at Le Mans. All these folks have a commonality of interest in creating something unique and wonderful and it is what ties all of us together. That, my friends, is a very good thing. By the way, did I mention Lichtenstein? See ya soon! Maybe at the next SEMA show. Thank you to everyone who attended our Super Cruise XIII event held on Sunday, February 7. We were blessed with great participation and beautiful weather. Our featured cars this year were vintage Japanese imports (japaneseclassiccarshow.com) and they added a whole new perspective to our show. Several photographers and bloggers have told us that our Super Cruise Sunday is the most diverse show they attend and, because of that, they look forward to it every year. This year's event was no exception. Folks brought everything from dragsters and off-road trucks to vintage Lamborghini's and motorcycles. It was a fantastic show! A big thank you to our fantastic Hillco staff for all of your help in making the show this year a huge success. Malinda, Thai, Andy, Jesse & Cody, we couldn't host this event without your efforts. A special thank you to Gary Brown, OC Car Guy, for all of his stellar emceeing on our behalf. His family's snack bar and the world famous Hillco hamburgers (available only once a year) were, as always, outstanding! 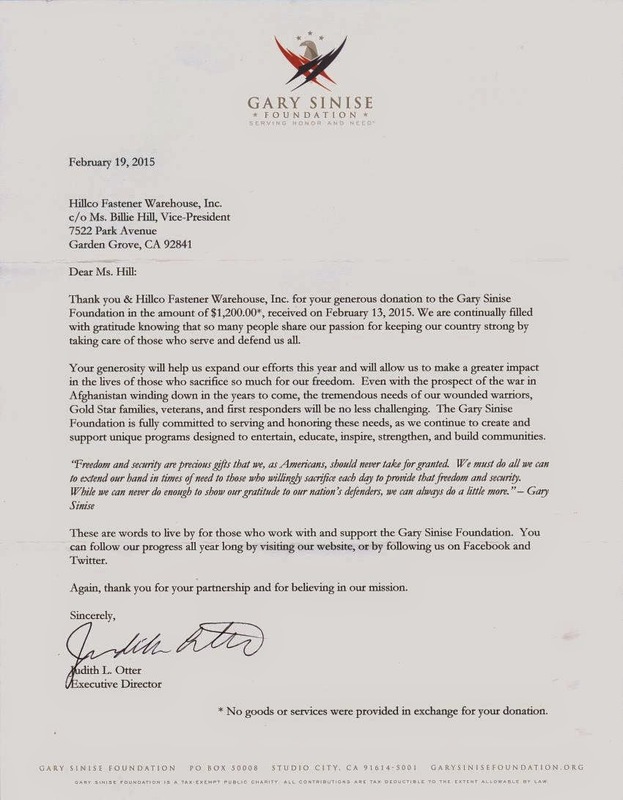 Our raffle ticket sales enabled us to make a $1,000 donation to the Gary Sinise Foundation. Thank you to our raffle sponsors, Gary Brown of OC Car Guy, Superior Automotive, Hoist Services, Suzette's Exclusive Hair Salon, Hotchkis Performance, Alpha Tools, Cars, Inc., and Chris Licata of Beach Coast Insurance for your generous donations. Gary Sinise Foundation is an outstanding organization that provides support to veterans, first responders and their families, and we're very proud that your donations give us the opportunity to support such a worthy cause. Thank you again to all of you who participated in our show this year. We appreciate the hard work and commitment that goes into creating your rolling works of art, and we look forward to seeing you again next year for Super Cruise XIV! I was born in Illinois in 1938, and I’ve always loved automobiles. One of my tricks, to impress girls as a teenager, was to close my eyes and accurately identify any car just by hearing the engine. Automobiles are movement and sound as well as many other things to me. During the 50’s the roar of a flathead Ford or the rat-a-tat of a stovebolt Chevy 6 were music to my ears. When I came to California, courtesy of the U. S. Marine Corps in 1957, I started attending road racing events. At these events the 283 c.i. Corvette bellowed around the courses at a speed that was in the “Oh My God” category. I was also introduced to the baleful whine of a Porsche twin cam, the rip of the A.C. Bristol and the scream of a Ferrari V12. There were many others too, but I think you get the point. A few months ago, courtesy of Kyle Mohan and Matt Hill of KMR Racing, I attended the Formula Drift Competition at Irwindale. 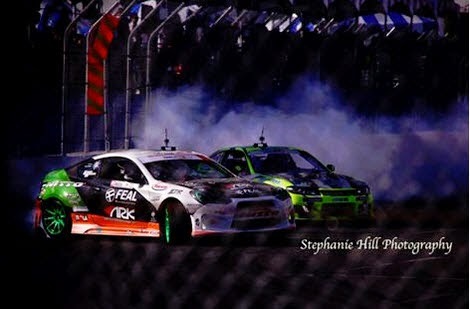 Although I’ve been around as a fan and occasional participant in road racing, I must say the spectacle of drift racing hit me like being dropped into a cage of roaring lions. The sight and sound of these races is a visual and audible feast! The fabrication work on all of the cars was absolutely top rate. These cars are high tech in every way and, unlike us older guys who thought “Make it bigger, it will go faster,” these builders use sophisticated computerized engine management systems that will make a 3.5 liter Toyota 2JZ put out a cloud of tire smoke large enough to hide a tank battalion on the attack. With that thought in mind, I began to wonder “What do we call these techno-geniuses squeezing all of this power and sound out of these relatively small motors?” It was then that it hit me! When my computer at home won’t work, who do I call? The Geek Squad! That used to be an offensive name, but today it’s used to describe someone who is intelligent, specifically regarding the use of computers and technology. So it came to me: “Thunder Geeks!” When these “Thunder Geeks” apply their expertise to these high-performance machines the result is ground-pounding, tire burning music to these 77 year old ears. You like sound, drama, power and technology? Don’t miss the next drift event! Sadly, today is the last day at Hillco for one of our long time employees. Paul Cartwright has been with Hillco Fasteners for over twelve years. We are very sad to see him go, but he is looking forward to a well-deserved peaceful and relaxing retirement. He has been a dependable and hard working part of our team and we will miss the entertaining stories of his past and present adventures. Good luck Paul, and thank you for your service and friendship. Follow this link to an interesting article about our oldest long-time employee. Russ Rosell is 93 years old, a WWII vet, and still works 2-days a week! We think he's a treasure and truly amazing! Enjoy! The proceeds from our Super Cruise XII were donated to the Gary Sinise Foundation. We received the following letter from the Foundation acknowledging receipt of our donation made possible by all of those who participated in our raffle and 50/50 drawing. Hillco's Super Cruise XII held on February 1, was an absolutely fantastic event. We appreciate everyone attending, and were stunned by the variety of autos, trucks, bikes, semis and anything and everything on wheels brought to our show! A big thank you to everyone who made time to participate in our event. Thank you to Joe & Arlene Jill of Superior Automotive, Hoist Services, Gary Brown (OC Car Guy), NAPA Garden Grove, Morgan Graphics, Hot Wax Car Care Products, DJ Safety Equipment and Beach Coast Insurance & Financial Services for their generous donations to our raffle table. We had a fantastic array of raffle items this year and the ticket sales for both the raffle & the 50/50 drawing enabled us to make a donation of $1,200 to the Gary Sinise Foundation. A special thank you to the entire Hillco crew. Malinda, Steve, Andy, Leo and Jesse, we couldn't do the show without you, and we appreciate you giving up a Sunday to help with our annual event. A special thanks to Gary Brown, the OC Car Guy, for coordinating the show, managing the snack bar and emceeing. As always, an outstanding job. Thanks again to all of you for sharing your projects with us. Be sure to check out photos of the show on our site and www.socalcarculture.com, and the beautiful video created for us by Mr. John Anderson. We love seeing your rolling pieces of art and look forward to seeing all of you again at Super Cruise XIII in 2016!! 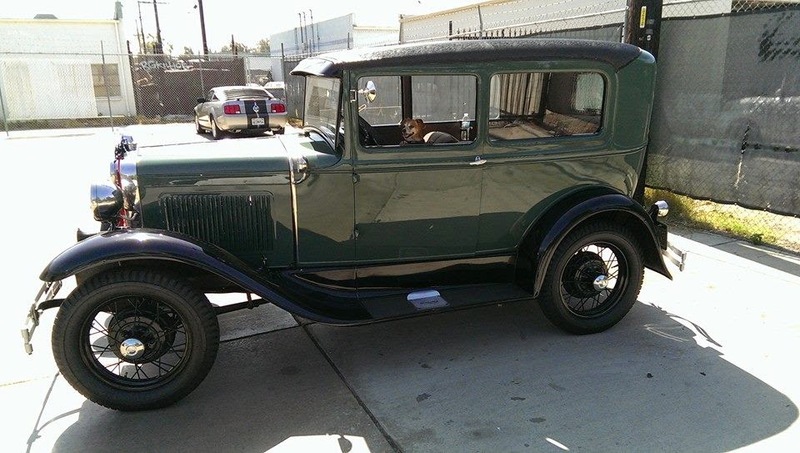 Richard Garrett in his beautiful 1930 Model A. 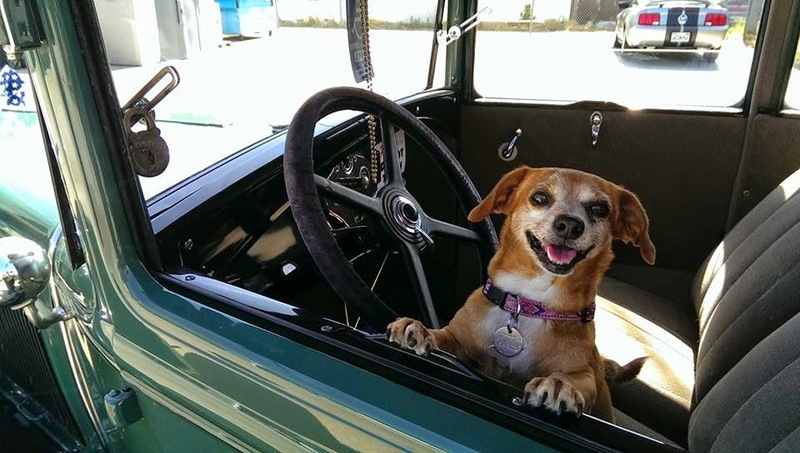 He had his driver ( Miss Daisy ) bring him by so he could do a bit of shopping here at Hillco Fastener Warehouse. 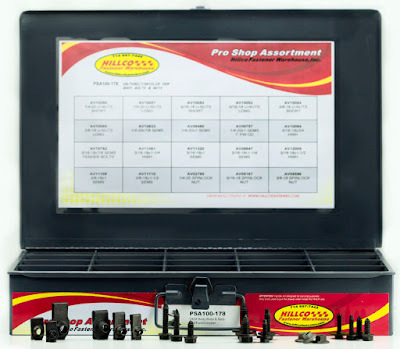 Hillco Fastener Warehouse is now stocking Bolt Motorcycle Hardware. Bolt Motorcycle Hardware is manufactured specifically for motorcycles, is reliable in even the most demanding conditions, and will provide your bike with the original-equipment fastener look, fit and finish. Orangewood Children's Foundation has been providing much needed services to children and teens in the foster care system, former foster youth transitioning to independent adulthood, and at risk families, for many years. Our annual Super Cruise event held on Super Bowl Sunday each year gives us an opportunity to raise funds for this very worthwhile organization. This year our raffle ticket and 50/50 ticket sales generated a $750 donation. 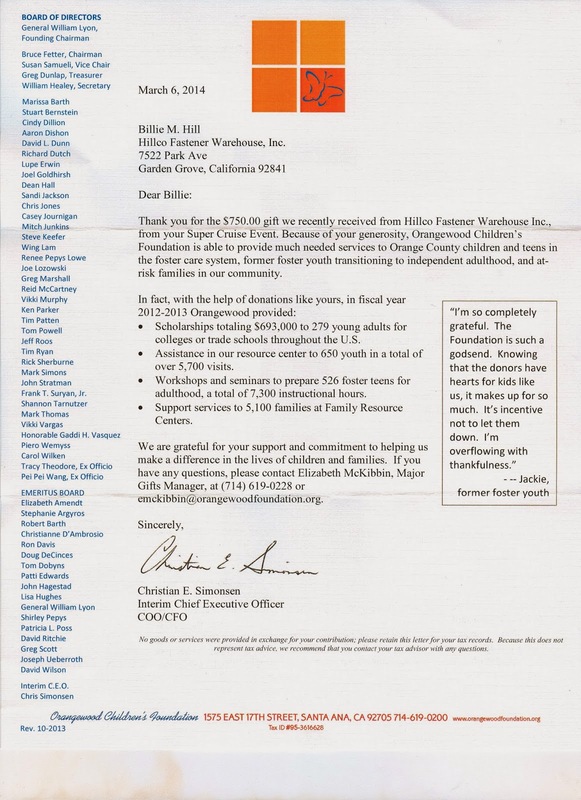 Below is a copy of the letter we received from Orangewood acknowledging this year's donation. 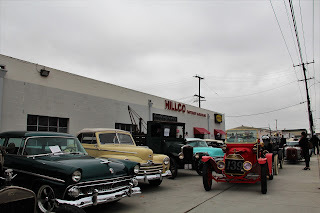 Hillco's Super Cruise XI held on February 2, 2014, was our biggest and best event ever! We look forward to Super Cruise every year because it gives us the opportunity to see your projects, and to raise a few dollars for our favorite organization, Orangewood Children's Foundation. We invite everyone to bring anything on wheels, and this year did you ever! You brought everything from semi's to skateboards! We had a ton of fun, raised $750 for Orangewood Children's Foundation, and hope all of you enjoyed it too. Many thanks to Gary Brown, our emcee and show organizer, for his hours of hard work pulling things together getting ready for the show. He always does a stellar job for us, and we truly appreciate all of his efforts on our behalf. A big thank you Malinda, Delilah, Steve, Cameron and Andy for your outstanding work and support throughout the day of the show. Thanks again to all of you for attending our show, and for your support through the years. We enjoyed seeing all of you and are looking forward to Super Cruise XII in February 2015! Our Super Cruise X event held on Sunday, February 3, was a huge success. This event is the highlight of our year because it gives us the opportunity to meet all of you and see your projects in the flesh. Attendance this year was outstanding . . . between 450-500 cars, bikes, and anything else on wheels, on display. The weather also cooperated and we had a beautiful, sunny day! A huge thank you to Hoist Services, Napa Auto Parts Garden Grove, Superior Automotive, Guzman Automotive, Darling Bolt, HPS Performance Silicone Hoses, C.A.R.S., Inc., Suzette's Exclusive Hair Salon and OC Car Guy for their donations to our door prize and raffle tables. Combined with the sale of 50-50 tickets, our raffle raised $650 for Orangewood Children's Foundation of Orange County. A special thank you to the hard-working Hillco Fastener Warehouse crew for their efforts to ensure everything ran smoothly. They do a great job every year. Thank you to everyone who came out and supported our show this year! We're looking forward to Super Cruise '14 and hope to see all of you again. Bullard Abrasives: Over the last 10 years the bonded abrasives industry has witnessed a significant shift in production in favor of low-cost producing nations such as China and others that subsidize exports to such an extent that a significant cost advantage is gained. These events have impacted prices so negatively that many U. S. producers have ceased to exist. Bullard Abrasives, Inc. refuses to be a casualty of this market shift. Hillco is proud to be stocking Bullard's high-quality resin fiber discs, grinding wheels and cut-off wheels in the most popular sizes. Please call us, 714 657-7442, or email Ryan@hillcofasteners.com, for further information. California Torque Products: California Torque Products, Inc. is dedicated to providing industry, manufacturers, and consumers the highest quality torque products and innovative solutions to meet their torque tool needs. Please call 714 657-7442 or email Ryan@hillcofasteners.com for further details. HPS Performance Silicone Hoses: HPS silicone hose is available instraight coupler, 1 foot tube, 3 foot coolant tube, charge air cooler hose (CAC), hump coupler, reducer coupler hose, 45 degree elbow coupler and 45 degree elbow reducer, 90 degree elbow coupling and 90 Degree reducing elbow. HPS performance silicone vacuum hoses and silicone heater hose is also available. HPS silicone hose is available in both standard inch and hard-to-fine metric sizes. HPS stainless steel t-bolt clamps are available to match with the silicone hoses. In order to eet the high demand and shorten the turnaround time, up to 90% of HPS silicone hose is in stock locally and ready to ship or pick up from Hillco. Please call 714 657-7442 or email Ryan@hillcofasteners.com for additional information. Hillco Fastener Warehouse is now stocking the K-Four line of automotive electrical products. The extensive K-Four line has it's roots in the tough off-road market, being on the Baja 1000 winners for the past two decades. Hillco's massive inventory of nuts & bolts, rod ends, A-N plumbing products, and now K-Four makes it your one-stop for all our hardware needs. Come by and check us out! Proper fastener selection is critical to a successful project. 18-8 stainless steel fasteners have a tensile strength of 100,000 p.s.i. (pounds per square inch). They are of moderate strength and are adequate for holding on fenders, running boards, valve covers, and intake manifolds (without super-chargers). Stainless is superior to Grade 5 and Grade 8 on most applications where there is heat, i.e. exhaust manifolds, headers, etc. and they have the obvious advantage of being corrosion resistant. ARP 300 stainless is heat-treated and superior to normal stainless steel in every way. It has a tensile strength of 170,000 p.s.i., which is superior to standard Grade 8 products. Where strength is required as well as the other attributes of stainless steel, ARP is the best choice. They’re pretty too! To prevent seizing and galling of stainless steel nuts and bolts, always use antiseize. Use antiseize or ARP lubricant with ARP stainless as well. Plated Grade 5, which has a tensile strength of 120,000 p.s.i., is also excellent for bolting on fenders, running boards, valve covers, and intake manifolds (without super-chargers), or any other general application where Grade 8 is not required. Some of our customers use Grade 5 when fabricating projects, and convert to stainless or ARP for final assembly. Grade 8 should be used on suspension or anything else that spins, slides or thrashes about in any way. This includes alternators, power steering pumps, smog pumps, air conditioning pumps, and bolts that hold the fan blades. Keep in mind that whenever a fastener is used in a moving or shaking or rotating application its life is reduced by 92% compared to a static application. Grade 9 (F-911) bolts have a tensile strength minimum of 180,000 p.s.i. This product is used by heavy trucking, earth-moving equipment maintenance shops, and off-road racers. We recommend using extra thick heavy-duty washers and Grade C lock nuts for a strong assembly. Washers are the most misunderstood fastener there is, and their importance is almost always understated or ignored. Grade 5 and Stainless Steel washers are for moderate use only -- fenders, valve covers, or any area where sheet metal or some other soft material is being used. On all heavy-duty installations, as noted above, use Grade 8 flat washers. Always use either lock washers or lock nuts without fail. We have two kinds of lock nuts. The first and most common is the nylon insert lock nut (Nylok). This nut is best used in applications where moderate strength is required. The effectiveness of the nylon locking material will degrade under high temperatures. In larger sizes, Nyloks will perform adequately on suspension as long as the bolt is in shear, but we recommend Grade C lock nuts because of their superior strength. Grade C lock nuts can withstand moderate heat(under 300°F) for long periods of time without degradation. Grade C lock nuts are sometimes called stover nuts, oval locks, crimp nuts, and top lock nuts, and should always be used with a Grade 8 flat washer. While there are more than one hundred different AISI (American Iron and Steel Institute) chemistry grades of stainless steel, the most commonly used in commercial fasteners (nuts, bolts, washers, fittings) are types 18-8 and 316. "18-8" is short-hand for 18% chromium and 8% nickel. This alloy content is found in types 302,303, and 304 stainless steel. While they offer a high degree of corrosion resistance, they are slightly magnetic. So don't be fooled just because your stainless washers stick to your magnet. Also, there is a small presence of iron in 18-8 fasteners, so they can corrode in severe conditions. 316 stainless generally offers better corrosion resistance and is even referred to as "marine grade stainless," but it is not resistant to warm sea water. 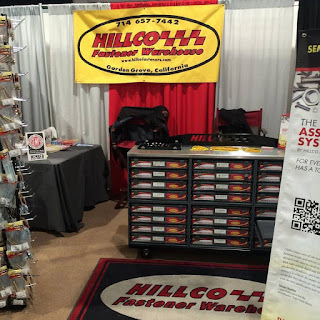 Here at Hillco Fastener Warehouse, 99% of all stainless steel fasteners we sell are 18-8, which is sufficient for pretty much all street rod or other automotive projects, in terms of corrosion resistance. Contrary to popular belief, and probably the most common misconception about fasteners held by our customers here at Hillco, stainless steel fasteners are not very strong. Now, please don't confuse strength with toughness. Anyone who's ever attempted to drill or cut a stainless bolt knows how tough they can be. But for purposes of this article, let's understand that strength refers to tensile strength. A type 18-8 or 316 stainless steel bolt typically has a tensile strength of around 80,000 psi, which is only slightly stronger than a Grade 2 bolt. If I had a nickel for every customer who came to me explaining that he wanted to use stainless steel bolts in place of his stock suspension bolts, I'd be a rich man. But, if I sold them to them, I'd be a poor man due to being sued for selling them weak bolts! There are other types of high strength stainless bolts that are now available for such applications, but they are usually a special order item, as they are too expensive to keep in stock. So, if you need something strong that will not rust, call us and we'll help you find exactly what you need. Our good friend and business associate, John Lazenby of Royze, Inc., recently shared this with us. We thought it was very entertaining and hope you will too! which you had carefully set in the corner where nothing could get to it. the wheel hub out of which you want to remove a bearing race. adjacent the object we are trying to hit. the next tool that you will need. "Who buys this stuff?" Hillco employees get that question everday. Odd for someone to be standing in our store, presumably to buy something, or with someone who is looking for some nuts or bolts from our product line, but I digress. 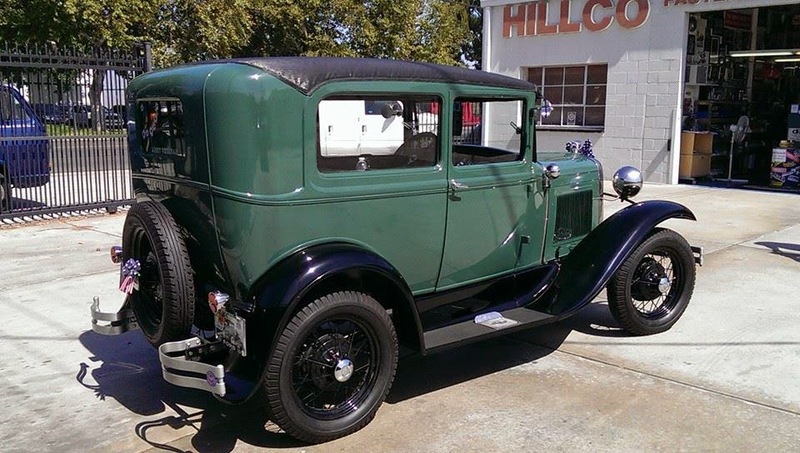 While Hillco has enjoyed serving customers large and small in lots of industries, our "bread & butter" has been the auto repair or paint and body/restoration shops. My dad, and Hillco's founder, Jack Hill, has been dutifully calling on and supplying much needed fasteners to shops from San Diego to Los Angeles and the Inland Empire since the early 1970s. He's still at it today, and can't wait for tomorrow. Over the years, he developed a program, called Accu-Pak, which serves as a guarantee to never over-fill the hardware bins or assortments found in most shops. You've seen the gray cabinets (sometimes red, blue, or brown) filled with the various nuts, bolts, fittings, or connectors at your local repair garage. Well, unfortunately, some sales reps have taken advantage of a trusting shop owner by filling those drawers to the brim, regardless of the customer's usage. The guys in the shop just sign for it, the sales rep sends a bill to the A/P department and hopes the owner never even catches on. Most owners do catch on, however, as they watch their dollars just like you and I do. This has the negative effect of causing all shop owners to look down upon fastener salesmen, making cold-calling very tough, and, sometimes uncomfortable. So Hillco guarantees never to do that. This program has served us well over the years. We have a very consistent customer base. In some shops we are now dealing with the second generation, as some owner's children have taken over the family business. As Jack says, "We lose more customers to the cemetery than to the competition." So, if you need a saleman to come by and check your bins, please give Hillco a call. If you don't have any bins, or you need a fastener assortment, Hillco has a great selection of professional shop assortments. 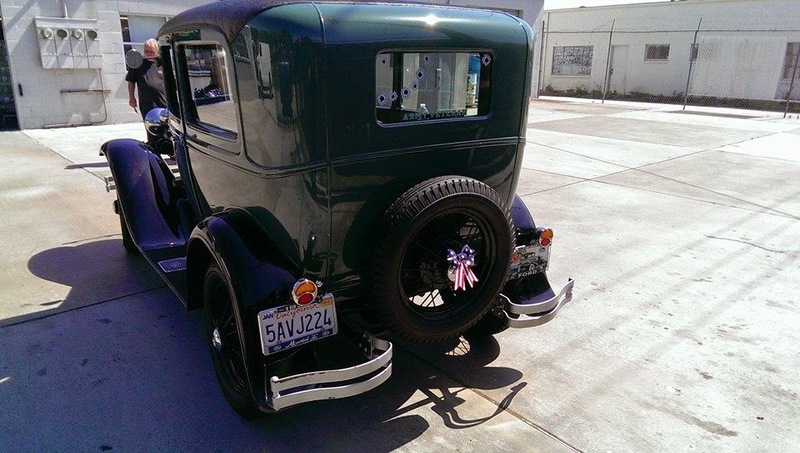 We are the most trusted and respected name in automotive fasteners in Southern California, since 1976.